Strat's cria are taking home CHAMPIONSHIPS! 19 CHAMPIONSHIPS as of June 8, 2009!! And he only has two year's worth of crias on the ground! Mapiya just took the Fawn female Color Champion at the Nationals Fleece Competition!!!!! 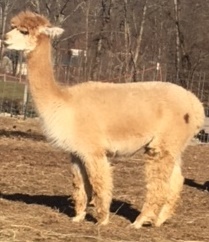 We are pleased to announce, along with Canterbury Farms, that ADAMS PINELINE ALPACAS is now our NEW partner! We are thrilled to be able to share the news and be in one of the best partnerships ever!!! STRAT is now back in Oregon. Help us celebrate by calling Robin at PHA in Oregon, 503-625-4482 or 503-970-3921 (cell) to schedule your drive-by breed now at our special price (but you must CALL to reserve!). Strat is an exceptional proven stud male -- medium fawn full accoyo with rare genetics (one of only 4 MF full accoyo Legacy sons at last count)! His dam was an accoyo import (great dam /consistent producer; now deceased) and his sire Accoyo Legacy (now deceased) was the highest selling (1/2 share) stud male to date. Strat has done very well in the show ring and now it's his crias' turn. So many great attributes; he is a male for discerning breeders. Recent Statistics: - 60% females in 2008 of reported cria. - When bred to color, he is throwing almost all color. - When bred to white, he is throwing 25% fawn, 75% white. - He has had 7 blacks out of fawns and browns. - He has just thrown an exceptional true black out of black dam! We are thrilled! He usually gets the females bred in just one breeding. 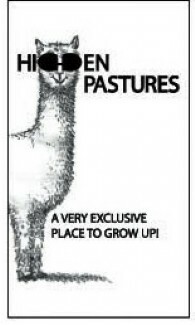 - At the OABA Alpacafest, there were 9 Strat offspring entered in the shows. They consistently ribboned in the top three, and it was a Strat daughter who won the Fawn Fleece Championship. Maybe it's your turn to produce a championship offspring from your favorite female! Call us today! What happens when you mix Hemingway and Royal Fawn? "Ivory Rose"!!! Ivory Rose is awesome to say the least!! She took a 3rd place ribbon at her first and only show in a tough class of 13. She was the youngest in that group! Wade Geese said he needs to put his sun glasses on because of her intense brightness. After her first shearing her fiber got even better. This spring Ivory Rose had a lovely fawn female out of Stratosphere. We are planning on breeding her this fall to color,as she has color in her background. Glimmer is a truly stunning young lady. The combination of Stratosphere and Ivory Rose was certainly a good one. Her sire is PHA Accoyo Stratosphere a well known Legacy son, and her dam is Ivory Rose, an Accoyo Maverick daughter, a well know Royal Fawn son. Giving her a well known genetic Accoyo pedigree. 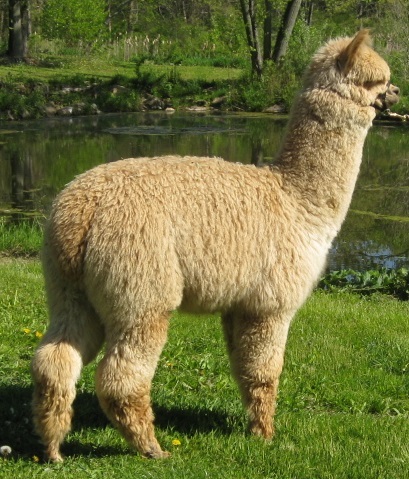 Her fleece is a lovely medium fawn with a very long staple length in bright crimpy fleece. Last year at shearing she had a body weight of 88 pounds and her shear weight was an exceptional 4.5 pounds. She does have a dark heart shaped spot on her right rear hip and we are concerned how this might present in the show ring. For this reason, we are showing her fleece from last year in fleece shows this year. Regardless of the outcome, we feel that Glimmer is a winner and we look forward to breeding her this spring upon her return from the show. Glimmer producted a beige male when bred to our very own Total Eclipse of the Moon. We like what we see and are planning a rebreed.